By Keith Cowing on June 30, 2011 10:26 PM. "Disasters apart, the shuttle generally succeeded in at least one aspect of its mission: its regular launches (not to mention stunts such as flying a 77-year-old astronaut, and assorted senators and congressmen) made space travel seem routine, almost mundane--which helped to dampen public interest." "But the shuttle is now over. The ISS is due to be de-orbited, in the inelegant jargon of the field, in 2020. Once that happens, the game will be up. There is no appetite to return to the moon, let alone push on to Mars, El Dorado of space exploration. The technology could be there, but the passion has gone--at least in the traditional spacefaring powers, America and Russia." By Keith Cowing on June 30, 2011 8:01 PM. 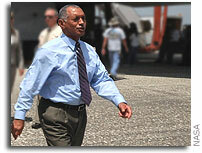 Keith's update: The National Press Club (NPC) invited Charlie Bolden to speak at a luncheon and he accepted. No cost to NASA. NPC makes a lot of money renting out their rooms for press conferences and hosting these luncheons so having Bolden there is a guaranteed money maker. The original NPC notice for this event said it was for NPC members and their guests. That was eventually amended to say that the public could attend too (and pay $36) or watch the event on TV and web streaming. But no one will be allowed to ask Bolden questions directly. You have to submit them ahead of time and then NPC screens them and asks the questions they have selected. They also added that the media could "cover" this too. When I inquired what media "coverage" meant they said that I had to have a "hard badge" credentials. When I asked them what credentials they mean (NPC, NASA, NASA Watch, etc.) they did not answer. NASA HQ has not issued "hard" media credentials for more than 5 years - so media who only cover NASA are not going to have these things. I asked NPC if I could simply make a laminated badge (as editor of NASA Watch) and credential myself (other media outlets/publications do this). I have asked them three times. No response. As such I have to assume that I will not be allowed on the premises to cover this event - but if I want to pay $36 (the food is awful so I never eat it) I can sit and listen but not ask questions. How odd. The NPC is supposed to be promoting journalism and news coverage - yet they put a barrier between media who cover their events by requiring all questions be submitted in advance. In addition, they pick and chose as to what media allowed to "cover" the event based on whether or not they have some sort of laminated name tag (they are not exactly clear on where you get these tags). And those who do not meet their criteria have to pay money to have access to the government official who is speaking. What is really odd is that I have covered events at the NPC multiple times in the past decade and asked questions of the speakers. Now they suddenly go retro. NPC is a business, so they need to make money I suppose. What is odd is how they hold themselves up as some sort of bastion of journalistic integrity and excellence when in fact they are stuck in the the way that the news media used to work - not the way that it actually works today. Its like having lunch at The Dinosaur Club - they follow a process that is quickly becoming extinct. They invite a newsmaker to their club and then go out of their way to prevent news media from doing their job i.e. covering (interacting) with that same guest. How this is promoting excellence in journalism and news coverage baffles me. Funny thing: I have discovered that a number of reporters on the space beat are inclined to skip the event (since no questions will be allowed) and just watch it back in their office. So much for fostering interaction between newsmakers and reporters. 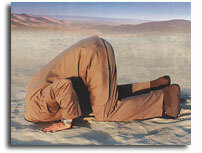 Bolden is not expected to make any "news" either since nothing about SLS etc. is included in his prepared remarks and questions will be screened/filtered in advance. The food (money making) part of the event begins at 12:30 pm EDT. Bolden's remarks will begin just after 1:00 pm EDT, followed by a staged question-and-answer session. To submit a question in advance, type BOLDEN in the subject line and email president@press.org before 10 am EDT tomorrow. The luncheon program will be on C-SPAN, NASA Television and webcast live via NPC. By Keith Cowing on June 30, 2011 3:38 PM. "JWST ISIM - Davila and Mehalick/551: The JWST Standing Review Board (SRB) outbrief to the project was held last Friday. The SRB heard from the project regarding the new baseline plan (including budget and schedule) for a launch date of fy18. The SRB reported that the new baseline plan for JWST was not viable due to lack of sufficient funding in fy11 and fy12, rapid ramp-up of support planned for fy13 and marginal reserves for the years fy13 fy18. The SRB was very complimentary of the new OTIS testing structure, and systems engineering take-over by GSFC." "Hubble's successor -- the James Webb Space Telescope (JWST) -- is in a heap of trouble. Things were already bad in October, when it was supposed to launch in 2014 and its price tag stood at $5 billion. Then in November, an independent review said its costs had risen to $6.5 billion and that it would not launch until 2015. Now, a review board says the 6-metre segmented telescope may not even get off the ground in 2018. A baseline plan that includes the telescope launching in fiscal year 2018 is "unfeasible", according to an internal memo from Goddard Space Flight Center in Greenbelt, Maryland, that was first disclosed today by NASAWatch." Keith's note: According to NASA PAO: "NASA is still developing and discussing a new cost and schedule baseline plan for JWST. It's simply premature to make any conclusions until a plan is completed and reviewed within the agency and by an outside team of experts. This will ensure adequate levels of both cost and schedule reserves are in the appropriate years to successfully complete JWST development." By Keith Cowing on June 30, 2011 10:14 AM. "NASA is still developing its acquisition strategy and has not settled on the specific mechanisms it will use for procuring commercial crew transportation services. The Commercial Crew Program Planning Office (Commercial Crew Office) plans to present its proposed acquisition strategy to Congress by late summer 2011. Mindful of national policy to limit the use of high-risk contracting vehicles such as noncompetitive and cost- reimbursement contracts, among the options NASA may consider is an acquisition strategy that relies on funded Space Act Agreements, competitive procurements, in particular fixed-price contracts, or a combination of both." Keith's note: NASA is looking at no longer using Space Act Agreements for this sort of thing (at least that is what they have told OMB/OSTP) and they may soon be falling back on bad habits when it comes to dealing with the private sector. Stay tuned. By Keith Cowing on June 30, 2011 9:32 AM. "A U.S. Air Force Minotaur 1 rocket carrying the Department of Defense Operationally Responsive Space Office's ORS-1 satellite was successfully launched at 11:09 p.m. EDT yesterday from NASA's Launch Range at the Wallops Flight Facility and the Mid-Atlantic Regional Spaceport in Virginia. "We are very pleased to continue our support to the U.S. Air Force and the Operationally Responsive Space Office (ORS) with today's successful launch," said Bill Wrobel, director of NASA's Wallops Flight Facility. "This is the fourth Minotaur 1 launch from Wallops since December 2006 and we look forward to collaborating with the Air Force and ORS on future projects." By Keith Cowing on June 30, 2011 12:30 AM. Keith's note: A personal note about aerospace companies and corporate giving. Every company who supported the nuclear space event at the Air & Space Museum tonight has a clear, consistent record of giving to meritorious causes. All aerospace companies do. I know many of the people who write the checks and the professional associations that participate. I have worked with these people on educational and outreach projects. Their intentions and generosity, while facilitated by commerce, are honest and true - and if at all possible they'd love to be able to spend much, much more if only the funds were there. Indeed, some of their projects are simply inspired. Often times they fill in the gaps where NASA is lacking in funds or flexibility and push their employers to squeeze out a few more dollars. Continue reading Dear NASA: Please Focus on Space Exploration, Not Menus. By Marc Boucher on June 29, 2011 3:34 PM. "The Grand Finale of NASA's three decade long Space Shuttle program is less than two weeks away. Recently NASA allowed reporters unprecedented access to photograph the Space Shuttle Atlantis while it waits on the pad. Here is part one." By Keith Cowing on June 28, 2011 9:00 PM. "Further information on the mission, including where to view the launch, is available here. The launch will be web cast beginning at 1:30 p.m. on launch day here. Launch status can be followed on Twitter." "NASA's Wallops Flight Facility in Virginia has rescheduled the launch of an United States Air Force Minotaur 1 rocket carrying the ORS-1 satellite for the Department of Defense's Operationally Responsive Space Office. Originally set for June 28, the new launch date is June 29. The launch on June 28 was postponed due to thunderstorms in the area." By Keith Cowing on June 28, 2011 3:26 PM. "Space shuttle Atlantis' Commander Chris Ferguson and his three crewmates are scheduled to begin a 12-day mission to the International Space Station with a launch at 11:26 a.m. EDT on July 8, from NASA's Kennedy Space Center in Florida. The STS-135 mission is the final flight of the Space Shuttle Program. The launch date was announced Tuesday at the conclusion of a flight readiness review at Kennedy. During the meeting, senior NASA and contractor managers assessed the risks associated with the mission and determined the shuttle and station's equipment, support systems and personnel are ready." By Keith Cowing on June 28, 2011 3:22 PM. "This is in response to your letter of June 22, 2011, signed jointly with Chairman Rockefeller, regarding the Committee's request for various documents and records concerning NASA's implementation of the NASA Authorization Act of 2010 and asserting that NASA has refused to provide the documents. NASA's initial response of June 3 included three documents that the Committee specifically identified, a list of all contracts modified since passage of the Authorization Act, several hundred pages of contract documents, and lists of NASA officials as requested. As your previous letter also requests, NASA is continuing its preexisting bimonthly briefings to your staff (most recently on June 17) and my staff is in regular phone contact with your staff concerning our ongoing search for and review of documents and e-mails related to sections 302, 303 and 304 of the Act. I want to make clear that we are still gathering and reviewing documents responsive to your request and, to the extent NASA has confidentiality interests in the requested information, are working with Committee staff to accommodate the Committee's interests. We have not intended to convey a refusal to provide information to the Committee, and instead seek to continue to work to fulfill your requests consistent with our obligations." According to a statement issued by NASA PAO last week: "NASA has been working aggressively to implement the Authorization Act approved late last year and funded just this spring. We have selected the crew capsule for deep space exploration, awarded nearly $270 million dollars in funding to American companies hoping to transport our astronauts and their cargo to the International Space Station and announced a ground-breaking precursor mission to an asteroid, which could eventually lead to a human exploration. In addition, the agency has launched important scientific missions, pushed forward with our aeronautics research and continued to inspire the next generation of scientists and engineers. The agency is working to respond to the Senate Commerce Committee request and compiling the records requested." By Keith Cowing on June 28, 2011 12:11 AM. "Time is running out to enter the 2011 "Create the Future" Design Contest. Entries for the ninth annual contest are due by June 30th. Click here to submit your design idea. Sponsored by COMSOL, Creo - a PTC product, and Tech Briefs Media Group, the contest recognizes outstanding innovations in product design, awarding a Grand Prize of $20,000 USD. New this year is an Electronics Design category sponsored by Digi-Key Corp. Other categories are Consumer Products, Machinery & Equipment, Medical, Safety and Security, Sustainable Technologies, and Transportation. Entries can be submitted by individuals and/or teams in up to seven categories. The top entry in each category will receive a workstation computer from Hewlett-Packard. The top ten most popular entries, as voted on by site registrants, will get a 3D mouse from 3Dconnexion. All qualified entrants will be included in a drawing for NASA Tech Briefs T-shirts, and the winning entries will be featured in a special supplement to NASA Tech Briefs magazine. If you haven't submitted your design, you have until June 30th to visit www.createthefuture2011.com and enter your great idea." Keith's note: This whole NASA Tech Briefs thing just baffles me. They use the NASA name and logo and post all manner of cool things related to tech transfer, spinoffs, etc. - yet they do not issue press releases - and NASA PAO, CTO, IPP, CIO, SOMD et al never promote what NASA Tech Briefs is doing. Mark Uhran at SOMD is forever babbling about how interested the private sector is in ISS utilization. Great - he may well have a valid point - yet I see no evidence that SOMD and NASA Tech Briefs even know that the other exists. Sounds rather dysfunctional. Why bother to coordinate, eh NASA? By Keith Cowing on June 27, 2011 9:58 PM. "July 1, 2011. 12:30 PM. This event is open only to members of The National Press Club & their guests." Keith's 6 June note: Well, unless media, citizen journalists, or plain old taxpayers who wish to attend/cover this event happen to be paid members of the National Press Club (or invited by a guest), access to Bolden's remarks will only be offered to a select few. So much for that whole openness/transparency thing. Keith's 18 June update: It looks like media (and the public) can attend but it will cost up to $36 to get in (but it will be webcast live) and no one can actually ask questions at the event since the website says "Submit questions for speakers in advance and during the live event by sending them to @QNPCLunch on Twitter, or email a question in advance, with BOLDEN in the subject line, to president@press.org before 10 a.m. on July 1." This makes sense, of course. Screening questions in advance is always a good way to limit embarassment of a guest and is also an efficient means to avoid having to answer questions from certain individuals. Keith's 27 June update: According to Melinda Cooke at the National Press Club I "need to be a member of the press and have hard pass press credentials." Alas, NASA stopped issuing "hard" press credentials more than 5 years ago. Oh well. I guess I'll have to pay - but wait: no one can actually ask Bolden questions at the event (they must be submitted in advance and will be screened) - so what's the point of "covering" it anyway? What a great way to keep the NASA-centric media away from NASA-centric events - require a press badge that NASA no longer issues! Sheer genius ! 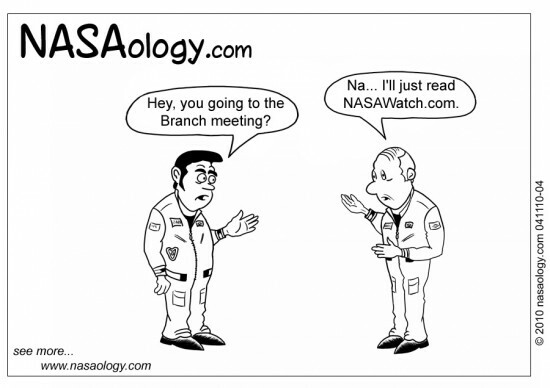 Hmm, maybe I can print one out that says "NASAWatch.com" and then laminate it myself. I am the editor so I hereby authorize myself. Funny, no one at NPC ever asked me for one in the past. Oops. Busted. By Keith Cowing on June 27, 2011 5:50 PM. Keith's note: Shuttle Launch Director Mike Leinbach recently spoke his mind (audio file) as Shuttle Discovery was being prepared for launch - the last time anyone will prepare a Space Shuttle for launch. "We're all victims of poor policy out of Washington, DC - both at the NASA level and the executive branch of the government. ... I'm embarrassed that we don't have better guidance out of Washington, DC. Throughout the history of the manned spaceflight program we've always had another program to transition into. .. we had that and it got cancelled and we don't have anything ... frankly as a senior NASA manager I would like to apologize that we don't have that." Let's see, NASA is still building Constellation's Orion (MPCV) human spacecraft, is about to announce its new SLS heavy launch vehicle design (pretty much an Ares -V variant), and SpaceX is gearing up to launch humans and cargo to the ISS aboard Dragon spacecraft a few miles away from Leinbach's office with NASA as a customer. Yes, its the end of this particular government-operated human space flight program and a lot of people will be laid off (despite working their butts off for years), but it is rather inaccurate for Leinbach to state that "we don't have anything". NASA abandoned the Saturn V because trips to the Moon were over and the Space Shuttle was to be used to build things in low Earth orbit. The ISS is now completed, so the continued rationale for the shuttle is a hard case to make. Now we need a way to use the ISS with vehicles better suited to the task - at a price lower than NASA can do on its own while getting ready for what comes after ISS. Despite the steady progression from one program to the next that Leinbach suggests, he forgets to mention that there was a 6 year gap between the Apollo-Soyuz flight and STS-1. Dragon will be flying people much sooner than 6 years - and certainly much sooner than NASA's Ares 1 would have flown crews in Orion. Things change Mike. The shuttle's retirement was announced 7 years ago. This is not exactly a surprise. By Keith Cowing on June 27, 2011 2:11 PM. "On March 29 & 30, NASA hosted its first Open Source Summit at Ames Research Center in Mountain View, California. The event brought engineers and policy makers from across NASA together with well-respected members of the open source community together to discuss current challenges with NASA's open source policy framework, and propose modifications that would make it easier for NASA to develop, release, and use open source software." By Keith Cowing on June 27, 2011 10:29 AM. "NASA workers looking for a job after space shuttle Atlantis' final flight likely won't have much luck at nearby Cape Canaveral Air Force Station, which has launched a generation of military and national-intelligence satellites. The military-rocket business isn't doing too well -- at least according to United Launch Alliance, a partnership of Boeing and Lockheed Martin that manufactures the bulk of the rockets launched into orbit by the military. Company officials said the cost of parts has gone up, and the uncertainty of post-shuttle work at NASA has resulted in subcontractors raising prices. As a result, ULA is sharply increasing the prices it charges the Defense Department to launch military satellites, prompting the Air Force to raise its projected launch costs by nearly 50 percent during the next four years." By Keith Cowing on June 25, 2011 8:00 PM. "NASA has selected a shuttle-derived vehicle with two existing liquid-oxygen/liquid-hydrogen stages as its reference design for the heavy-lift Space Launch System that Congress has ordered it to build for exploration missions beyond low Earth orbit, but it will hold a competition between liquid- and solid-fuel boosters to get it off the pad. Administrator Charles Bolden on Wednesday endorsed the basic concept developed by launch vehicle experts at Marshall Space Flight Center (MSFC), and sent it on to the White House Office of Management and Budget for confirmation." "Since the law's enactment, NASA has provided Congress with SLS reference designs that also closely resemble the Ares 5, but at the same time warned that the vehicle could not be fielded on the designated schedule under current budget scenarios. Industry sources privately questioned the affordability of NASA's latest strategy, given that it adds a brand new engine development program to the mix. Some also have suggested that competition will slow the SLS development effort. Shelby disagrees. He wrote that he has "seen no evidence that foregoing competition for the booster system will speed development of SLS or, conversely, that introducing competition will slow the program down." Shelby also said the SLS language in the authorization act gives NASA sufficient leeway to hold a competition." By Keith Cowing on June 24, 2011 11:43 AM. "Over the past few weeks, the National Aeronautics and Space Administration (NASA) has repeatedly refused to provide documents the Senate Commerce Committee needs to conduct appropriate oversight of your agency. We are writing to inform you that if you do not provide these documents to us by 6:00 p.m. on Monday, June 27, 2011, Chairman Rockefeller will issue a subpoena requiring the production of these documents." "The 2010 Act requires NASA to provide a number of reports on implementing the policy changes; however, despite several reports, dozens of briefings, and two Commerce Committee hearings since the Act's passage, NASA's progress in implementing the policy changes remains unclear. We are now requesting the information and documents listed below to determine what steps NASA is taking to comply with the law. ... Please provide the requested information and documents by June 3, 2011." By Keith Cowing on June 24, 2011 11:38 AM. Keith's note: Sources report that project management for the Webb Space Telescope's OSIM (Optical SIMulator), over budget due to not meeting the BIA (Beam Image Analyzer) schedule, has decided to save money by capping charge time for all contractors (not government employees). There are approximately 15 employees working on OSIM. Their time is being cut to 20 hours per week from 1 July to 1 October 2011. This terminates insurance and benefits for the contractor employees involved because they are forced to be part-time employees. Civil servants keep their full salaries. By Keith Cowing on June 24, 2011 11:05 AM. NASA's Dawn spacecraft is on track to begin the first extended visit to a large asteroid. The mission expects to go into orbit around Vesta on July 16 and begin gathering science data in early August. Vesta resides in the main asteroid belt and is thought to be the source of a large number of meteorites that fall to Earth. By Keith Cowing on June 24, 2011 11:03 AM. "A 'real-time data translator' machine converted a Mariner 4 digital image data into numbers printed on strips of paper. Too anxious to wait for the official processed image, employees from the Voyager Telecommunications Section at NASA's Jet Propulsion Laboratory, attached these strips side by side to a display panel and hand colored the numbers like a paint-by-numbers picture." By Keith Cowing on June 24, 2011 10:30 AM. "Today, in a speech at Carnegie Mellon University, President Obama is launching the Advanced Manufacturing Partnership, a research initiative that will promote a renaissance of American manufacturing. ... four agencies (the National Science Foundation, the National Institutes of Health, NASA, and the United States Department of Agriculture) are issuing a joint solicitation that will provide up to $70 million in research funding for next-generation robotics." By Keith Cowing on June 24, 2011 1:29 AM. "Dulles, Va.-based Orbital remains under contract to build OCO-2, a duplicate of the $200 million carbon-mapping satellite destroyed in a 2009 Taurus XL launch failure blamed on payload-fairing separation error. However, the $68.1 million NASA had budgeted for a February 2013 Taurus XL launch of OCO-2 has been "temporarily put on hold" as the agency evaluates "launch services options for the OCO-2 mission," according to NASA's 2011 initial operating plan." By Keith Cowing on June 24, 2011 1:27 AM. "UrtheCast is building, launching, and operating the world's first and only high definition streaming video cameras being installed on the International Space Station (ISS). UrtheCast will supply video data and imagery of Earth collected by two HD cameras on the Russian module of the Space Station. This data and imagery will be down-linked to ground stations around the planet and then displayed in real time on the Internet and distributed directly to UrtheCast's exclusive partners and customers." By Keith Cowing on June 24, 2011 12:00 AM. "For too long, the economy of Florida's Space Coast has been too heavily dependent on a small number of huge government projects. This narrow business model calls to mind the adage "if you only own one stock, you probably deserve what you get when it goes down." ... Fortunately though, the dawning era of commercial American space efforts is giving rise to a far wider variety of new space systems and projects with refreshingly diverse markets and backers. The opportunity is there to create a Florida space economy that will be far more robust than any in the past 50 years." By Keith Cowing on June 23, 2011 7:33 PM. "From March 24-26, 2010, NASA's Goddard Space Flight Center (GSFC) hosted an open international workshop to bring potential users and providers of on-orbit servicing capabilities together with the NASA GSFC Satellite Servicing Study Team. The event workshop drew together 57 individual speakers and over 250 participants from industry, academia, NASA, other agencies, and international organizations. ... The servicing mission study activity will result in a report to NASA, and subsequently to Congress, on the results of this workshop together with the integrated results from the servicing study team. The final report to Congress is currently under NASA review." "NASA will execute a robust study, led by Goddard Space Flight Center under the direction of the Space Operations Missions Directorate (SOMD). The planning activity began in May 2009 and a final report to Congress is due in September 2010." Keith's note: It has been more than a year since the meeting. The On-Orbit Satellite Servicing Study Project Report was posted recenty (18 June) here. But NASA GSFC never bothered to tell anyone that it had been posted - nor did they bother to link from the page that announced the study. But according to this page "An internal Project Report captures the work performed under the congressional mandate. SSCO's report to Congress is currently under review." So they have yet to deliver the report to Congress - and the report was due for delivery 10 months ago. "NASA officials said that they have no intention of developing a satellite refueling business to compete with private industry. "NASA managers have met with officials from MDA and Intelsat, who understand that NASA plans to take the RRM hardware to the International Space Station to use as a technology test bed," NASA spokesman Michael Curie said in an emailed response to questions. "The results of the RRM tests will be shared with everyone, including them. NASA is not doing this to compete with industry. In fact, by conducting these tests on the space station, NASA believes it will help reduce the eventual risk and cost to industry." By Keith Cowing on June 23, 2011 1:39 PM. "While NASA and America's space program are in a time of transition, one thing that most people can agree on is the need to press forward with human space exploration. Our country's commitment to exploring space is a key in keeping the United States at the forefront globally of science and technology. Space exploration and a deeper understanding of how we can best utilize the great unknown is also vital to our national-security interests." By Keith Cowing on June 23, 2011 1:37 PM. "More than 3.3 million U.S. jobs in agriculture and industries rely heavily on Global Positioning System (GPS) technology and the disruption of interference with GPS posed by LightSquared's planned deployment of 40,000 ground stations threatens direct economic costs of up to $96 billion to U.S. commercial GPS users and manufacturers, according to an economic study released today." Deere said its tests have shown that LightSquared's wireless signal interfered with Deere's GPS-dependent system more than 20 miles away. The U.S. Defense Department, Federal Aviation Administration and General Motors' OnStar subsidiary have complained of similar problems with LightSquared's network. By Keith Cowing on June 23, 2011 1:04 PM. "An Aerojet AJ26 engine destined to power the Orbital Sciences Corp. Taurus II launch vehicle in the run-up to commercial resupply flights for the International Space Station (ISS) was badly damaged in a fuel fire June 9. "There was significant damage to the engine," Orbital spokesman Baron Beneski said June 21." By Keith Cowing on June 23, 2011 12:12 PM. "Why Commercial Crew and Why Now? - For the first time in history, we have a long-term, sustainable market for commercial human space transportation services"
By Keith Cowing on June 23, 2011 10:42 AM. "TEA Party in Space (TPIS), a non-partisan organization, today publicly released the TEA Party Space Platform "This is our response to the vacuum of leadership in Washington, D.C., for America's national space enterprise," said Andrew Gasser, President of TPIS. "Whether it's timidity from the White House or Congress' earmark-laden 'compromises', our space dreams will be stuck on this planet unless someone articulates a vision based on economic and technical reality, so that's what we've done." This platform, and its specific planks, are grounded in sound science, technology, and the TEA Party's core values. The TEA Party in Space Platform promotes fiscal responsibility, limited government, and stimulation of the free market." By Keith Cowing on June 22, 2011 4:22 PM. Keith's note: SOMD AA Bill Gerstenmaier made a presentation to the 16 June Space Council meeting. The last slide (larger image) from his presentation (the rest of it is just pretty pictures) titled "Capability Driven Exploration" offers some insight into where a combined SOMD/ESMD exploration plan might be headed. Alas, this chart (and the path it suggests) is "notional" - like just about everything NASA says about its future plans these days. You have to wonder how long the agency can limp along with all this "notional" stuff taking the place of real, concrete, executable plans for exploration. By Keith Cowing on June 22, 2011 12:53 PM. "After some time off, I will look at new opportunities and am hopeful that one day I will again serve our country." "Astronaut Mark Kelly, the husband of Rep. Gabrielle Giffords (D-Ariz.), announced Tuesday he would retire Oct. 1.Kelly, a captain in both NASA and the Navy, has been mentioned as a possible Senate candidate in Arizona next year. Media reports throughout the state have said Kelly would be the leading choice for Democrats if Giffords is unable to run for retiring Sen. Jon Kyl's (R-Ariz.) seat. The space shuttle commander has said nothing to spark this talk, but his retirement announcement will likely increase the speculation." "Senator Mark Kelly? That's the question in political circles this week. The minute Kelly, 47, announced his retirement from the Navy and NASA Tuesday, the behind-the-scenes speculation that's been brewing for weeks went public: Will the husband of Rep. Gabrielle Giffords run for office himself?" By Keith Cowing on June 22, 2011 10:21 AM. "NASA Inspector General Paul Martin today released a report that examines the $32.8 million re-siding project for Hangar One - one of the world's largest freestanding structures - at NASA's Ames Research Center in Silicon Valley, California. Hangar One, built in the 1930s to house the naval airship the USS Macon, covers approximately 8 acres and is listed on the National Register of Historic Places. NASA acquired the hangar in 1994 as a result of the base realignment and closure process that involved Moffett Field, a Navy base adjoining Ames." By Keith Cowing on June 22, 2011 9:52 AM. "In a lawsuit filed Tuesday in Washington, D.C., a group claims NASA is withholding documents that show James Hansen failed to comply with ethics rules and financial disclosures regarding substantial compensation he earned outside his $180,000 taxpayer-paid position as director of the Goddard Institute for Space Studies. ... Mark Hess, chief of communications for the Goddard Space Center, sent Fox News NASA's response to Horner's FOIA request. It said in many cases the documents Horner requested did not exist. Horner claims they should, if Hansen was complying with the law." "NASA argues the release of the records would constitute a "clearly unwarranted violation of Hansen's privacy rights," and says ATI's lengthy explanation of Dr. Hansen's outside work "had not made the requisite showing that the documents requested would contribute to the public's understanding of the activities of the Government, or how it would shed light on NASA's performance of its statutory duties." By Keith Cowing on June 21, 2011 9:37 PM. Keith's note: I had a rather special guest visit me today at the Lunar Orbiter Image Recovery Project (LOIRP) at Building 596 (aka "McMoon's") at NASA Ames Research Center. Dan Goldin. Having Dan visit was really cool. It was great to have him stop by and visit our rebel operation. I really enjoyed showing him around. Dan asked a string of very sharp, cogent questions and offered us some valuable advice. He totally gets the value of such things and the importance of history - and that we have adopted the mantra of "older-better-cheaper". Dan was at Ames as part of the memorial services for the late Baruch "Barry" Blumberg. Barry was a mutual friend of ours. As I mentioned at the memorial ceremony, Barry once told me "you and Dan are a lot alike. I just wish you two could get along". Well, after Barry's passing, we do. Barry's amazing "people skills" continue to work their magic. Larger photo here. Where Is The Solar Electric Propulsion BAA? By Keith Cowing on June 21, 2011 11:28 AM. "NASA issued a Broad Agency Announcement (BAA) seeking proposals for mission concept studies of a solar electric propulsion system demonstration to test and validate key capabilities and technologies for future exploration missions. ... For more information about the announcement, visit: http://nspires.nasaprs.com"
Keith's 20 June note: This press release was issued last Friday. The BAA that this release announces is still not online at http://nspires.nasaprs.com. I asked PAO about it last week and they said there was some sort of procurement disconnect. One would think that a procurement activity announced in a press release as being available would actually be "available" before that release is issued. Keith's 21 June update: NASA finally got around to actually issuing the BAA that they announced as having been released 4 days ago. By Marc Boucher on June 21, 2011 10:56 AM. Speaking at the Paris Air Show on Monday, Mr Dordain said: "We are not in a very comfortable situation, and that's just a euphemism. The biggest lesson from the international space station programme is entirely the lack of a joint transportation policy." "The International Space Station is a splendid co-operation between five partners, but they did make a mistake ... we didn't discuss things sufficiently." By Keith Cowing on June 20, 2011 8:25 PM. "Among the speakers scheduled at the tribute celebration are former NASA Administrator Daniel S. Goldin, Ames Research Center Director S. Pete Worden and members of the Blumberg family. Also featured will be a video tribute and presentations by the Mars Institute, the Challenger Center for Space Science Education, and NASA Ames. The tribute will be webcast at http://connect.arc.nasa.gov/blumberg"
Keith's note: I will be making a presentation on Tuesday on behalf of the Challenger Center for Space Science Education. By Keith Cowing on June 17, 2011 2:30 PM. "This month 150 competitors answered the federal government's initial call for private sector cosmic ideas. Officials say some big names are among those interested. 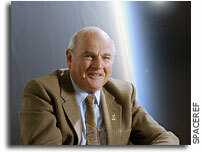 The plan is to make interstellar travel possible in about a century." "Just like all the technology development that DARPA has done in the past which required only small initial investments but ultimately lead to things, such as the internet and GPS technology -- as well as NASA's investment in space travel which has spawned items we use every day here on Earth -- they believe a small investment now could lead to a big payoff for everyone in the future." "We have no idea what interstellar travel might look like in 100 years, of course -- just as Jules Verne could never have conceived of the technology required to really send humans to the moon when he wrote about it in 1865. But if we start now, we can make it happen, according to David Neyland, who directs DARPA's Tactical Technology Office." By Keith Cowing on June 16, 2011 3:59 PM. "Spaceship builder SpaceX claims its NASA contract to ferry cargo and astronauts to the International Space Station was compromised by a spacecraft safety company's defamatory allegations of mechanical failures and explosions, and it says the allegations were spurred by its refusal to give the defendant a $1 million consulting contract. SpaceX - Space Exploration Technologies Corp. - sued Valador and its vice president Joseph Fragola in Fairfax County Court. SpaceX claims Fragola contacted U.S. officials "to make disparaging remarks about SpaceX, which have created the very 'perception' that he claimed SpaceX needed his help to rectify." By Keith Cowing on June 16, 2011 2:13 PM. "A century can fundamentally change our understanding of our universe and reality. Man's desire to explore space and achieve the seemingly impossible is at the center of the 100 Year Starship Study Symposium. The Defense Advanced Research Projects Agency (DARPA) and NASA Ames Research Center (serving as execution agent), are working together to convene thought leaders dealing with the practical and fantastic issues man needs to address to achieve interstellar flight one hundred years from now." Keith's note: Cool stuff. Yet NASA PAO makes zero mention of this event. I asked DARPA why this is the case in a telecon today. They said that this is because they have the lead on this and that NASA is doing the right thing by referring all inquiries to DARPA. I then asked if NASA will be allowed - encouraged - to openly participate in the conference that DARPA is holding in Orlando this Fall. DARPA said that NASA would be sending speakers, etc. DARPA is supposed to be posting a link to the proceedings of a workshop that they held with NASA a few months ago. When I asked if NASA would be asked to post a link to this report, DARPA did not know. This is all rather baffling. The intent of this project is to spur imagination and new technologies such as life support, energy production etc. The DARPA folks are really good at this sort of thing and are being very inclusive. The cost is barely a blip on people's radar screens. This thing is bursting at the seams with potential spinoffs - and is the sort blue sky, what-if activity that you'd expect - hope - that a forward-thinking space agency would engage in - yet NASA HQ is going out of its way to ignore it. Go figure. By Keith Cowing on June 16, 2011 11:46 AM. Keith's note: NASA Administrator Charles Bolden and his wife are off on an official tour of Europe - a lot of which is reportedly filled with vacation time and light duty in terms of work. Nice gig if you can get it. Here's a photo of hiim being a motivational speaker to French students earlier today. By Keith Cowing on June 16, 2011 9:37 AM. "So this brings us reasonably up to date. I can't discuss many more details because we're still in the competitive phase of acquiring this cooperative agreement, but I can say that NASA has received multiple proposals from a strong and highly competitive field. The selection decision is imminent, and you can expect an award announcement later this summer upon successful completion of final negotiations." Keith's note: Once again, NASA is incapable of meeting its own timeline. "Later this summer" is not 31 May 2011 - as NASA had promised. Rather, it is months away. (see "ISS National Lab: Two Weeks Late - Still No Word") NASA does not know what it wants to do with the ISS - and does not know that it does not know. Moreover, it was forced at legislative gunpoint to pursue the NGO path. As such, it follows that selecting someone to implement such a non-existent utilization strategy is taking time to accomplish. As you read through Mark Uhran's comments to the STA yesterday, you will see two decades of stale, old-fashioned thinking recycled yet one more time - with the few examples of attempted ISS utilization sprinkled in as supposed examples of things to come. Uhran is welded to the old notion that only NASA can somehow stimulate private sector investment and empirical research on the ISS while retaining total control of the equation. This approach has not worked yet and it won't work in the future. I agree that the ISS has vast untapped potential - the true scope of which NASA has yet to understand. Alas, civil servant Uhran and his NASA organization are the least equipped to help realize that potential - yet they are in charge. This is a recipe for disaster and the squandering of a totally unique resource. By Marc Boucher on June 16, 2011 9:35 AM. "During the tanking test, the main fuel valve for Atlantis' No. 3 space shuttle main engine recorded temperatures below normal levels, indicating a possible liquid hydrogen leak. Teams isolated the engine and continued to fuel Atlantis with no issues and temperatures returned to normal readings. Technicians can gain access to the engine area once it is cleared from tanking test operations, and engineers will evaluate any necessary work on the fuel valve. If the valve needs to be replaced, managers expect that the work could be done early next week at the pad and still support Atlantis' July 8 target launch date." By Keith Cowing on June 16, 2011 8:08 AM. Keith's note: According to the ISS National Lab Management Entity CAN the "anticipated selection announcement" was 31 May 2011. That day came and went last week. Nothing was announced. Given that it took decades for NASA to get this far - and that they only did so after Congressional direction - one can expect that they will drag their feet on this process as long as they can. "The selection decision is imminent, and you can expect an award announcement later this summer upon successful completion of final negotiations." Keith's note: NASA is now crowing that the era of utilization operations on ISS will commence after the completion of the STS-135 mission and that there will be 35 hours of science operations per week with a 6 person crew. If we had advertised this low science operations rate back in the 1990s (when I worked on utilization and operations on the Space Station program) Congress would have cancelled the program outright - for cause. Given NASA's non-stop harping that the ISS is a "world class scientific research laboratory" Mark Uhran has some work to do: this 35 hour number needs to be doubled or tripled. 35 hours a week is unacceptable - its like saying that you need one full-time plumber, janitor, electrician, carpenter, mover, and assistant so that one scientist can do their research. That's not "world class" - rather, its pathetic for a $60 ($100?) billion investment. By Marc Boucher on June 15, 2011 3:00 PM. "I am concerned, therefore, that NASA is considering a Space Launch System architecture that relies on a booster system developed for the Space Shuttle. I am particularly concerned that this plan might be implemented without a meaningful competitive process. Designing a Space Launch System for heavy lift that relies on existing Shuttle boosters ties NASA, once again, to the high fixed costs associated with segmented solids. Moreover, I have seen no evidence that foregoing competition for the booster system will speed development of SLS or, conversely, that introducing competition will slow the program down." By Marc Boucher on June 15, 2011 11:55 AM. "Taken during mobility testing on June 3, 2011, this image is of the Mars Science Laboratory rover, Curiosity, inside the Spacecraft Assembly Facility at NASA's Jet Propulsion Laboratory, Pasadena, Calif."
By Marc Boucher on June 15, 2011 11:27 AM. "NASA is inviting the public to view a test version of the agency's next spacecraft that will carry humans into deep space. The Multi-Purpose Crew Vehicle, which NASA announced last month would be the agency's deep space crew module based on the original work on the Orion capsule, will make three stops as it travels by truck from NASA's Dryden Flight Research Center in California to the Kennedy Space Center in Florida." Marc's note: Tucson, Austin and Tallahassee residents can get an up close and personal look at the MPCV. Goodness, can't we just call it Orion or Orion2? The public's just going to go huh with that acronym. By Marc Boucher on June 15, 2011 11:12 AM. "The primary goal of the STS-135 flight is to haul the "Raffaello" multipurpose logistics module (MPLM) up to the International Space Station. The 21 foot long cylindrical module is mounted inside the shuttle cargo bay during launch and landing. Raffaello is a space 'moving van' and loaded with some 12 tons of critical supplies, spare parts and science equipment to stock up the station before the shuttles are retired forever, despite the fact that they have many years of service life remaining." By Marc Boucher on June 15, 2011 8:49 AM. "The nation's space agency plans to spend about half a billion dollars next year to replenish the pension fund of the contractor that has supplied thousands of workers to the space shuttle program. The shuttle program accounts for a vast majority of the business of United Space Alliance, originally a joint venture of Boeing and Lockheed Martin. With the demise of the shuttle program, United Space Alliance will be left without a source of revenue to keep its pension plan afloat. So the company wants to terminate its family of pension plans, covering 11,000 workers and retirees, and continue as a smaller, nimbler concern to compete for other contracts." "The single biggest check NASA expects to write next year will go to United Space Alliance (USA) to cover a half-billion-dollar shortfall in the space shuttle contractor's pension fund." By Keith Cowing on June 14, 2011 8:31 PM. "KING: All right, let's continue the conversation, but we'll come back to this if we have to. Let's go to Jean Mackin in Hancock. She has a question. MACKIN: Thanks, John. This question goes out to Speaker Gingrich. Next month, the space shuttle program is scheduled to retire after 30 years, and last year, President Obama effectively killed government-run space flight to the International Space Station and wants to turn it over to private companies. In the meantime, U.S. astronauts would ride Russian spacecraft at a cost of $50 million to $63 million a seat. What role should the government play in future space exploration? GINGRICH: Well, sadly -- and I say this, sadly, because I'm a big fan of going into space and I actually worked to get the shuttle program to survive at one point -- NASA has become an absolute case study in why bureaucracy can't innovate. If you take all the money we've spent at NASA since we landed on the moon and you had applied that money for incentives to the private sector, we would today probably have a permanent station on the moon, three or four permanent stations in space, a new generation of lift vehicles. And instead, what we've had is bureaucracy after bureaucracy after bureaucracy and failure after failure." "Why so quiet? Some NASA officials suspect Gingrich may be letting us know that the emperor has no clothes. Some insiders are wondering if NASA is operating with an outdated management paradigm better suited to the 1960s Apollo era rather than the 21st century." Continue reading NASA Mentioned in Republican Presidential Debate. By Marc Boucher on June 14, 2011 4:59 PM. "Devising ways to explore space in tight fiscal times tops the agenda of the 9th International Conference on Low-Cost Planetary Missions, set for June 21-23, 2011, at the Johns Hopkins University Applied Physics Laboratory in Laurel, Md." By Marc Boucher on June 14, 2011 3:33 PM. "A senior NASA official has signed the formal death warrant for the Constellation deep space exploration program even as work proceeds on one of Constellation's legacy development efforts and agency officials continue to ponder the fate of another. "I have signed the letter to close out the Constellation Program," Douglas Cooke, associate administrator for NASA's Exploration Systems Mission Directorate, wrote in a June 10 memo." Is the Sun's Cycle set to help Space Exploration? By Marc Boucher on June 14, 2011 1:01 PM. "If we are right," Hill concluded, "this could be the last solar maximum we'll see for a few decades. That would affect everything from space exploration to Earth's climate." By Marc Boucher on June 14, 2011 9:25 AM. "A major initiative has been placed on Family/Personal Preparedness for all NASA personnel. The NASA Family/Personal Preparedness Program is designed to provide awareness, resources, and tools to the NASA Family (civil servants and contractors) to prepare for an emergency situation. The most important assets in the successful completion of NASA's mission are our employees' and their families. We are taking the steps to prepare our workforce, but it is your personal obligation to prepare yourself and your families for emergencies." Marc's note: This video was released this past weekend for NASA employees. By Marc Boucher on June 14, 2011 9:03 AM. "LaserMotive is pleased to have the opportunity to demonstrate its wireless power technology next week at the NASA Day on the Hill. This annual event is open to the public as well as to Congress, but the presenters (such as LaserMotive) are by invitation only. Most of the presenters are from NASA or NASA contractors. However, LaserMotive is just one of two companies presenting that are not NASA contractors, making this honor extra special." Marc's Note: This is a good story. Here's a startup out of Seattle that entered and won the first phase of NASA's Power Beaming Centennial Challenge and has since gone on to build a business case for their technology development. You can see them in DC on the Hill tomorrow. "NASA has awarded $900,000 in prize money to a Seattle company that successfully demonstrated new wireless energy beaming technology which could one day be used to help power a "space elevator." By Marc Boucher on June 13, 2011 11:25 AM. "This movie shows surface details beginning to resolve as NASA's Dawn spacecraft closes in on the giant asteroid Vesta. The framing camera aboard NASA's Dawn spacecraft obtained the images used for this animation on June 1, 2011, from a distance of about 300,000 miles (483,000 kilometers)." By Marc Boucher on June 13, 2011 11:19 AM. Marc's Note: The video "One Earth" by Fiona Conn won NASA's Earth Day Video Contest. NASA's Earth Observatory blog latest post features all the entries. By Marc Boucher on June 13, 2011 9:38 AM. "An upper stage engine is essential to making space exploration outside low-Earth orbit a reality," said Mike Kynard, manager of the J-2X upper stage engine project at NASA's Marshall Space Flight Center in Huntsville, Ala. "The J-2X goes beyond the limits of its historic predecessor and achieves higher thrust, performance, and reliability than the J2. We are thrilled to have the engine in the test stand to validate our assumptions about engine performance and reliability." "Our little engine is pulled out of the air-conditioned confines of its assembly area and trucked across the NASA Stennis Space Center to its test stand. No more pleasantly cool and dry air for you, E10001. This is Mississippi in June. Thus, in order to make this trip out in the open like this on the back of the truck (don't try this at home! ), the engine has to be sealed up tight against the humidity (and bugs) hanging in the air. Anywhere where there is an opening, there is a cover, a closure, or a plug." By Marc Boucher on June 12, 2011 10:12 PM. "It seems really simple - just three letters. But they seem to annoy some of our users, who have let us know: "Why do I have to type www.nasa.gov and not just nasa.gov? Don't you people even know the basics of running a web site?" Marc's Note: I read this blog post and my jaw dropped. I've complained before that I didn't understand why I couldn't just type nasa.gov in any browser to get to NASA's web site. After all, technically it's a simple change to the domains Domain Name System (DNS) entry. Now I have the answer, NASA says it's an expensive move. Huh! Ok, sure NASA is a very popular web site. But changing the DNS entry so that queries typed in a browser as http://nasa.gov get redirected to http://www.nasa.gov shouldn't add prohibitive costs. No way. Continue reading Three Letters NASA Users Complain About. By Marc Boucher on June 12, 2011 10:19 AM. Marc's note: For the first time NASA's community-based forum, the Mars Exploration Program Analysis Group (MEPAG), will be holding its meeting outside the U.S., and in this case in Lisbon, Portugal. This is significant in the context of tighter budgets for all concerned where future Mars missions will see greater international cooperation to share costs while at the same time achieving mutual desired science and exploration results. The era of NASA doing Mars mission wholly or mostly on its own appears to be ending. At least for the foreseeable future. - Discussion of NASA's and ESA's Mars program status, budget, current missions, and forward planning. - First MEPAG meeting that can respond to the Decadal Survey results. By Keith Cowing on June 10, 2011 4:30 PM. "The California Space Authority, Inc., (CSA) has initiated the process of dissolving the non-profit corporation in accordance with state law and the by-laws of the organization," the group said in an e-mail statement to supporters. "The CSA board of directors voted unanimously on June 6, 2011, to begin the dissolution process and the members of CSA subsequently voted in favor of corporate dissolution. CSA will cease to operate effective today, June 10, 2011." By Keith Cowing on June 10, 2011 2:53 PM. "The Canadian Space Agency (CSA) will see it's budget peak this year at an all time high of $424.6 million then drop 34% over the following two years according to estimates released yesterday in their annual Report on Plans and Priorities. At the same the agency has completed an overhaul and restructuring of their Program Activity Architecture which in effect begins the execution of the agency's next Long Term Space Plan. While the CSA will in effect be executing the next Long Term Space Plan, the government has not seen fit to release an actual Long Term Space Plan document. This is somewhat surprising in the context that the very stakeholders who contributed to the plan want to see an official strategy document published." By Keith Cowing on June 10, 2011 11:12 AM. "With a burst of light, the United Launch Alliance Delta II rocket carrying the Aquarius/SAC-D spacecraft lifted off June 10, 2011 at 7:20 a.m. PDT (10:20 a.m. EDT) from NASA's Space Launch Complex 2 at Vandenberg Air Force Base in California." "Aquarius is the product of an international collaborative effort between NASA and the Argentine space agency, with contributions by Canada, France, Brazil, and Italy. This new capability will enhance and complement the European Space Agency's Soil Moisture and Ocean Salinity satellite designed primarily to measure soil moisture." Keith's note: There is a memorial banner on the launch tower that reads "In memory of our colleague and friend Hal Chase - the ULA Team". Hal Chase was a ULA employee at VAFB and passed away recently. By Keith Cowing on June 10, 2011 10:59 AM. "Most NASA 'insiders' rely on NASAWatch.com for timely NASA news. Run by a former NASA engineer with an attitude, Keith Cowing gives readers an unofficial [interesting] perspective on space news. Sometimes shocking, always interesting. Take a look NASA Watch." Please visit NASAology.com for more cartoons. By Keith Cowing on June 10, 2011 9:15 AM. "The launch of a NASA Terrier-Improved Orion suborbital rocket was successfully conducted at 7:16 a.m. EDT today from NASAs Wallops Flight Facility in Virginia. The launch was to test several new rocket and spacecraft technologies." Continue reading Suborbital Launch From Wallops Today (Update: Launch). By Keith Cowing on June 9, 2011 9:23 PM. "The Expedition 28 crew has expanded to six members with the arrival of Flight Engineers Mike Fossum, Sergei Volkov and Satoshi Furukawa. The new trio docked to the International Space Station in the Soyuz TMA-02M spacecraft Thursday at 5:18 p.m. EDT. The new crew members entered the station's Rassvet module to begin their stay when the hatches were opened at 8:34 p.m."
By Keith Cowing on June 9, 2011 6:40 PM. "Representatives from FAA AST, Washington, DC, conducted the audit. The audit consisted of a review of conformance to the terms of the Safety Approval as well as a review of the STS-400, including operating and safety procedures, operation and maintenance manuals, and inspection and maintenance documentation. Additionally, the use of the STS-400 in the NASTAR Center space training programs was reviewed and several training profiles were observed." By Keith Cowing on June 9, 2011 6:38 PM. "NBC Nightly News recently featured the commercial spaceflight industry in a piece examining the future of spaceflight following retirement of the Space Shuttle. "With just one more shuttle mission to go before the program ends this summer, a new space race is already well underway," says NBC anchor Lester Holt." By Keith Cowing on June 9, 2011 10:17 AM. Keith's note: According to NASA HQ PAO a movie compilation of Dawn approach imagery for Vesta will be released on Monday. The original plan had been to release this video on Friday but the delay in the launch of Aquarius pushed this back until next week. A plan is also being assembled whereby JPL releases one image per week until Dawn arrives at Vesta. This is a great start - but given that Cassini [example] - and MER [example] teams post raw stuff - warts and all - almost the instant they get it, one would hope that JPL PAO could be internally consistent and do the same with Dawn imagery as they do for other missions. The more they release, the more the public will come to understand just how it is that NASA does what it does - and do so by looking over robotic shoulders as a new world comes into view for the very first time. By Keith Cowing on June 9, 2011 7:29 AM. "NASA's inspector general issued a significant list Wednesday of items that need to be resolved before the next mission to Mars can be launched in November. Some say the challenges won't be resolved in time, causing the Mars team to miss their launch window. That's a problem because the next window for sending a craft to Mars isn't for two years -- and the cost of rejiggering the program to fit that window might be too high for NASA to stomach." "Furthermore, the report notes concerns with the way that the rover's plutonium-238 power supply has degraded in the two years since the rover's launch was delayed from 2009 to the current window, between October and December of this year." "Hundreds of unsolved problems could delay the launch of NASA's ambitious new Mars rover by two years and add more than $500 million to its budget, according to a report from the agency's inspector general. But NASA is downplaying the concerns, saying it is "very confident" that it will meet its intended launch window, which begins in November." Flat Budgets Ahead For NASA? By Keith Cowing on June 8, 2011 7:13 PM. "Euroconsult, the leading international consulting and analyst firm specializing in the space sector, along with the consulting firm Omnis, today announced the findings of a study today foreseeing a significant shift in NASA spending toward Earth science and R&D programs and away from legacy spaceflight activities. According to the report "NASA Spending Outlook: Trends to 2016," NASA's budget, which will remain flat at around $18.7 billion for the next five years, will also be characterized by significant shifts from space operations to technology development and science." By Keith Cowing on June 8, 2011 3:00 PM. "Recently, a joint letter was penned by three legendary Apollo lunar astronauts berating the Obama Administration for "Grounding JFK's Space Legacy" and declaring that a coherent plan for maintaining America's leadership in space exploration is no longer apparent. While it may be that the current administration's plans are not perfect - and a new national debate on space appropriate - these plans stand head and shoulders over the plan that was the latter implementation of the Constellation program. Furthermore, these space veterans have been misinformed pertaining to the reasons for the demise and cancellation of the Constellation program." By Keith Cowing on June 8, 2011 2:34 PM. "Our analysis of the Project's current estimate to complete development indicates that even the $537 million figure may be too low. Our analysis is based on the earned value management system budget data and estimates of the additional work that will be needed to address unknowns. We estimate that $581 million may be required - $44 million more than management's latest estimate. Based on our calculations, unless managers request additional money the Project may have insufficient funds to complete all currently identified tasks prior to launch and may therefore be forced to reduce capabilities, delay the launch for 2 years, or cancel the mission." Keith's note: A media teleconference is now getting underway with NASA PAO and SMD's Dave Lavery.. Replays of this conference will be available at 888-567-0444. Notes below. Continue reading NASA OIG Report on Mars Science Laboratory Released. By Keith Cowing on June 8, 2011 1:44 PM. "The Office of the Chief Information Officer (OCIO) is integrating and consolidating many IT services throughout the Agency. This new effort is called the IT Infrastructure Integration Program, or I3P. It will affect every employee who uses IT services such as: desktops, laptops, networks, etc. The scope of I3P is broad, entailing consolidation, improved governance, and central management of IT services in the areas of service desk and ordering, Web services and technologies, enterprise business and management applications, integrated communications/network services, and end-user services. Roll-out schedules will vary by each Center. Each Center's Chief Information Officer will send out more detailed information, but below you'll find a high-level summary of the new program." By Keith Cowing on June 8, 2011 8:17 AM. "The subject guidelines endorses doing away with the term "shall" to mandate requirements and using the term "must" instead. These guidelines were reviewed by the Office of the General Counsel who determined that these guidelines are arguably not mandatory for most of what we do, but prudent to implement across- the- board and use "must" instead of "shall." Therefore, NPR 1400.1, NASA Directives and Charters Procedural Requirements, will be adjusted to include the term "must," to denote mandatory action prior to approval. This requirement will be effective when NPR 1400.1 is approved. Please inform your directives reviewers and writers." NASA will continue to use the term "shall." The following updated e-mail was distributed to the Agency's Directives Managers on June 1: The following provides an update to the subject e-mail sent May 24, 2011: As stated in the initial e-mail, the Office of the General Counsel (OGC) reviewed the subject guidelines and determined that the guidelines are arguably not mandatory for most of what we do, but prudent to implement across- the- board and use "must" instead of "shall." OGC was asked to review these guidelines again and their view is that using term "must" instead of "shall" does not apply to internal directives, but can be implemented if the Agency decides to. Further, the Office of Management and Budget was consulted and they confirmed that using the term "must" IS NOT a requirement. It's up to the agencies to use the term. Therefore, the Agency WILL continue to use the term "shall" to denote mandatory requirements. Confused? Consult the official "Federal Plain Language Guidelines" at plainlanguage.gov and you must shall understand, I guess. SLS: A Rocket NASA Doesn't Need and Can't (Won't) Build? By Keith Cowing on June 7, 2011 9:39 PM. "I don't think we need it. I don't think we can afford to operate it. I think it will be rarely used and expensive to maintain," said Alan Stern, a former NASA associate administrator. "The most likely possibility is that it [the rocket] is unfortunately going to collapse under its own weight in a couple years." Already, NASA has told Congress that it can't build the rocket and its companion crew capsule by the 2017 deadline with the money -- at least $14 billion over the next five years -- it has been given. More seriously, NASA hasn't decided where it wants the rocket and capsule to go. Agency officials talk constantly about the ultimate goal -- Mars -- but that trip is likely decades away. Few are talking about what to do in the meantime." By Keith Cowing on June 7, 2011 4:21 PM. Soyuz TMA-02M/27S was launched on time at 4:12:45 pm EDT from the Baikonur Cosmodrome and is on its way to orbit. NASA astronaut Mike Fossum, Russian cosmonaut Sergei Volkov and Japan Aerospace Exploration Agency astronaut Satoshi Furukawa are on board. The spacecraft will dock with the ISS on 9 June at approximately 5:22pm EDT to the Rassvet module on the Earth-facing side of the station Thursday. After hatch opening, the trio will be welcomed aboard by their Expedition 28 crewmates, Commander Andrey Borisenko and Flight Engineers Alexander Samokutyaev and Ron Garan, who have been living and working on the station since April 6. By Keith Cowing on June 7, 2011 3:16 PM. "A congressional source said June 6 that NASA has delivered some -- but not all -- of the documents sought by the leaders of the Senate Commerce, Science and Transportation Committee, which authorizes funding for NASA. The agency delivered the documents June 3, which was the deadline set by the committee leaders in their May 18 letter to Bolden." By Keith Cowing on June 7, 2011 2:03 PM. "This image of the International Space Station and the docked Space Shuttle Endeavour, flying at an altitude of approximately 220 miles, was taken by Expedition 27 crew member Paolo Nespoli from the Soyuz TMA-20 following its undocking on May 23, 2011 (USA time). It is the first-ever image of a space shuttle docked to the International Space Station. " Keith's 7 June update:Huh? "the first-ever image of a space shuttle docked to the International Space Station"? Look at the photos below. People have been photographing shuttles docked to ISS for years. While we were all waiting for someone in Russia to find that SD card in the Soyuz with the pics on it, others were looking at another masterpiece by Thierry Legault - ground-based images and video as Endeavour and ISS fly overhead - in 3D! By Keith Cowing on June 7, 2011 7:01 AM. Keith's 3 June note: Ever wonder why those Dawn approach images are so few and far between? After a series of frustrating emails with NASA HQ SMD PAO all I can get is "We may be able to release some time in June. Working with JPL to get an exact date.". At least NASA HQ PAO responds. JPL PAO and project staff simply refuse to reply to formal requests/inquires. What an amazing mission this will be - two worlds revealed for the first time - but already the NASA team seems to be sitting on the cool stuff. Not a good sign. Keith's 6 June update: Still waiting for the release information - and images - from JPL. Actually, Veronica McGregor et al do not reply to email inquiries - only (to his credit) Dwayne Brown at NASA HQ PAO does. "I'm glad he replied to my email but I felt that [Dawn PI principal investigator, Christopher Russell] was missing the point of why members of the public would want to see approach images. It is not to enjoy pretty pictures. It is to "ride along" with the mission, to enjoy that thrill of discovering a new place for the first time. The Internet permits the public to participate vicariously in space missions, looking over the shoulders of the privileged few who get to (and get paid to!) explore the solar system through the eyes of robots." "Jim Adams, Deputy Director of Planetary Science, told me that the images from Dawn's Framing Camera will exceed those from Hubble in a few weeks." Keith's 7 June update: The article was published on 11 May. 27 days later and it is 7 June. That certainly counts as "a few weeks". Indeed it almost a month. JPL is sitting on imagery that is due to "exceed those from Hubble" - and they won't release any of it? Why? By Keith Cowing on June 7, 2011 5:04 AM. Keith's 26 May note: NASA sources report that Paolo left the memory card in the Soyuz when he climbed out. The Soyuz is being shipped now, so it will be next week before the images can be retrieved. Its quite understandable that you can forget to do some things when you arrive on a planet from outer space. Keith's 2 June note: It has been a week. So ... where are the photos? Keith's 2 June update: According to Ken Kremer "I asked Bill Gerstenmaier that question at the post landing press briefing (video) Look at about 31:00 for his answer - maybe aroundJune 8." Keith's 7 June update: While we're all waiting for someone in Russia to find that SD card in the Soyuz with the pics on it have a look at another masteriece by Thierry Legault - ground-based images and video as Endeavour and ISS fly overhead - in 3D! By Keith Cowing on June 6, 2011 9:15 PM. "Payloads selected under this announcement will fly on aircraft that provide parabolic flight trajectories and on suborbital reusable launch vehicles (sRLVs) that are capable of flying to altitudes above 100 km, providing exposure to reduced gravity and near-zero gravity environments. In exchange for the opportunity to fly, the proposer will provide data, designs, processes, and other relevant information to help NASA accomplish its mission." By Keith Cowing on June 6, 2011 4:41 PM. "Currently, NASA has several ways the public can learn about ISS sighting opportunities, including NASA SkyWatch. However, NASA's websites do not disseminate this information to the public- the public must seek it out proactively instead. NASA seeks to increase public awareness of the ISS, its visibility, and mission by making ISS sighting information, including personalized notifications, readily available to the general public in an easily accessible and understandable way. To that end, NASA seeks to collaborate with a domestic entity, on an unfunded basis, to support an ISS sighting notification tool." Keith's note: This is really a great idea. I certainly agree that this information could be more user friendly since "the public must seek [ISS sighting opportunites] out proactively instead." So, keeping that admission on NASA's part in mind, how does SOMD try to reach the public to ask for help? A NASA Procurement Notice. FAIL. How many people other than procurement wonks (and me) ever read these notices? Why limit this to "a domestic entity" i.e. a single source? Why not engage with lots of them? Why not seek input from individual citizens as well as "domestic entities"? One would hope that someone within the agency sees that this great idea and that press releases and other means are used such that a wide variety of possible contributors to this project can be involved. And even if NASA does not select them all, it is certain that a group of people who never thought they'd have a chance to do this will now be thinking about NASA. One look at this weekend's NASA-sponsored Random Hacks of Kindness will show you what a group of motivated people out in the real world can do in a matter of hours. If I can teach a Sherpa how to spot satellites in remote Nepalese villages such that he could then teach others, then NASA can certainly spur development of an app that also does that. Video: On orbit Intro for U2's "Its a Beautiful Day"
By Keith Cowing on June 6, 2011 9:33 AM. Keith's 5 June note : According to U2's official YouTube site: U2 delivered a surprise to the crowds at Quest Field, Seattle last night with a video message from Commander Mark E. Kelly. Bono dedicated 'Beautiful Day' to Gabby Giffords, before asking, "Imagine a man looking down on us from 200 miles up. Looking down at our beautiful crowded planet... What would he say to us...? What is on your mind Commander Kelly?" Commander Kelly, on a 16-day mission with the Endeavour crew, recorded the message aboard the International Space Station, "Hello Seattle... from the International Space Station." Before finishing on a line from David Bowie's 'Space Oddity' : "I'm looking forward to coming home. Tell my wife I love her very much... she knows." Keith's 6 June 9:20 am update : More videos: Audience video with Bono's intro. ; Nice view from close to the stage; another view from the lower level; and another view from close up. This version includes Mark Kelly reciting some of the lyrics of the song. What possesed these people who were in the audience to post this particular segment of the song to YouTube? There is a NASA astronaut in the video - so why hasn't NASA done so yet? Oh well, I am told they will do so later. Given the agency's habit of blocking YouTube some NASA employees won't be able to see this until they get home. Reader note: "Actually, JSC is not blocking access to YouTube videos (as long as they are not of an "adult" nature, I suppose). What happens is that a warning window with a yellow header shows up, warning the user that NASA has not "evaluated the content of this page" (or something like that). That's what you see in the NASA Watch page every time you post a YouTube video, or a link to it. However, if you click on the "Proceed" button, it'll let you go ahead to the site. Some people get intimidated by this warning window, though." Keith's 9:30 update NASA has now posted something on Facebook and Twitter. I have to wonder why JSC did not bother to inform NASA Headquarters about something of this magnitude. Someone at JSC had to approve the video shooting in the first place. Typical NASA - no one talks to anyone else - everyone is in charge - and no one is in charge. Oh well: it is a cool video - you must play it loud. Continue reading Video: On orbit Intro for U2's "Its a Beautiful Day". Is James Cameron Heading for the Moon? By Keith Cowing on June 5, 2011 6:59 PM. "The first of two $150 million tickets for a pioneering tourist mission to the moon was off the market Sunday, and its owner was rumored to be the world-famous "Avatar" director James Cameron. Space Adventures, the American company offering the trip scheduled for 2015, said only that the buyer of the ticket was a "well-known" personality. The expedition will begin aboard a Soyuz spaceship launched from Kazakhstan." "Space Adventures says one high-profile client has already made a reservation. And although the identity of that client is a closely held secret, The Sunday Times of London reports that Cameron is "the name said to be in the frame." The Times quotes unnamed associates of Cameron as saying he's been talking with NASA as well as the Russian space agency about mounting a 3-D camera on the space station to shoot a documentary patterned after "Aliens of the Deep," Cameron's film about the deep ocean. "The technology is very similar, and Jim is fascinated by outer space," one source told the Times. "But the cameras have to be made a lot lighter than current models." By Keith Cowing on June 5, 2011 11:03 AM. "Alan Boss, an astronomer at the Carnegie Institution for Science in Washington who chairs NASA's independent advisory committee on astronomy research, worries the project could eat up a growing share of the nation's funding for astronomy and space science. He's gone so far as to call the telescope's woes "NASA's Hurricane Katrina." NASA has since removed the project from its astrophysics budget, making it a higher priority and less of a drain there. But it's still part of the overall science portfolio, drawing from a limited pot of money. Cash spent on Webb can't be spent on other science, Boss said. NASA concedes Webb will be a priority. Until the issues with Webb are resolved, Boss said, "everything is on hold with regard to funding for any major new projects." By Keith Cowing on June 4, 2011 11:01 PM. 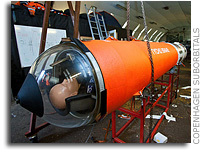 Keith's note: Copenhagen Suborbitals open-source private space rocket was launched and is being recovered. Go to: http://raketvenner.dk/launch/ for coverage and updates. By Keith Cowing on June 4, 2011 7:51 AM. "Boeing today sent layoff notices to 510 employees - including 260 in Houston - involved in space shuttle work. The notices give 60 days advance notice of an expected job elimination. The workers' last day would be Aug. 5, pending the completion of the final space shuttle mission, STS-135. Boeing said in a statement that is working to keep as many workers as possible by moving employees to program such as the International Space Station work." "[John Berry, director of the Office of Personnel Management] said OPM will sponsor a job fair in Cocoa, Fla. in late July, which will include training on seeking positions listed on USAJOBS.gov. Also, NASA has created a Web site, www.jobsforaerospaceworkers.com, where federal agencies can post jobs and "find additional information about the skills of the available workforce." By Keith Cowing on June 3, 2011 6:07 PM. "In this time of constrained budgets, it would be inexcusible to funnel billions of taxpayer dollars into a non-competitive sole-source contract for the new Space Launch System. By allowing a competitive process, NASA could realize hundreds of millions of dollars in annual savings, and billions in savings over the life of the program. Furthermore, a competitive process will build capacity and enhance the critical skills and capabilities at a wide range of aesrospace technology companies." Keith's 3 June update: When I asked ESMD AA Doug Cooke about this issue at a Women in Aerospace conference today he said that NASA "had not excluded" the option of a full and open competition for the SLS. That is not a "yes" - but it is not a "no" either. By Keith Cowing on June 3, 2011 1:15 PM. "My main concern in raising these issues was that NASA not become overly dependent on an unproven launch provider -- one that only achieved its first launch success 32 months ago, but now says it will soon be ready to loft U.S. astronauts into orbit. With that in mind, I thought I would focus this week on how the company's track record compares with that of established launch providers, and why the assumptions made in its business strategy aren't likely to pan out in the real world." "One of the oldest tactics in Washington is repeating a falsehood in a voice of deep conviction often enough that it eventually becomes the conventional wisdom. Loren Thompson, who masquerades as an independent, disinterested party, apparently believes in this approach." By Keith Cowing on June 3, 2011 11:43 AM. "Lee Scherer, who led Kennedy Space Center through its last major transition between human spaceflight programs, will be remembered in a service later this month near his home in San Diego, Calif. Scherer, KSC's second center director from 1975 to 1979, died May 7 at age 91. ... Joining NASA in 1962 on loan from the Navy, Scherer managed a program that launched five lunar orbiters mapping Apollo landing sites." Keith's note: We were beyond thrilled to have Lee Scherer visit our Lunar Orbiter Image Recovery Project (LOIRP) operation at NASA Ames in November 2008 as we released the newly retrieved and restored "Earthrise" image taken by Lunar Orbiter 1 in 1966. As he walked into Building 596 (aka "McMoons" - it used to be a McDonalds) Lee was clearly stunned to see that we had found all of this old stuff and got it working again. We all had a tear in our eyes - it was like being in a Star Trek episode where something comes back from the past to a future where it simply should not exist. for STS-130 - the shuttle flight that carried a piece of the summit of Mt. Everest and four small Apollo 11 moon rocks that had been to the summit up to the International Space Station. The past meets the future once again. Photos of Lee's visit to McMoons and LOIRP here. By Keith Cowing on June 3, 2011 9:20 AM. "Under the agreement, the companies will pursue contracts for the manufacture of liquid rocket engines for NASA through the Space Launch System program as well as for other customers. It is anticipated that as a result of this work, a potential 1,400 additional jobs could be brought to the Northern Alabama and California areas." "I am glad to hear about today's announcement of a strategic partnership between Teledyne Brown Engineering and Aerojet - General," said U.S. Sen. Richard Shelby, R-Tuscaloosa. "The potential addition of 1,400 high quality engineering and manufacturing jobs in Huntsville would be great news for the community. "Congress directed NASA to develop a 130-metric ton Space Launch System with a first and second stage that leverage our Ares investments. The Teledyne-Aerojet team could have a critical role to play designing additional elements of the system, and I hope NASA looks at their capabilities carefully." By Keith Cowing on June 2, 2011 8:16 PM. Keith's note: This document presented by Maria Collura on 22 April 2011 at Masters Forum 20 on Commercial Crew Program Overview contains additional information on the various NASA contractors NASA is supporting. This presentation used to be online but NASA then pulled it offline. You can still download it here. Help NASA Reduce Its Regulatory Burden! By Keith Cowing on June 2, 2011 11:12 AM. "As part of its implementation of Executive Order 13563, Improving Regulation and Regulatory Review, issued by the President on January 18, 2011, NASA is seeking comments on the Agency's preliminary plan to conduct a retrospective analysis of its existing regulations. The purpose of this analysis is to make NASA's regulatory program more effective and less burdensome in achieving its regulatory objectives." By Keith Cowing on June 2, 2011 10:12 AM. "NASA Inspector General Paul Martin today released a report that found NASA has incurred approximately $304 million in additional costs for an important meteorological satellite due to failures by the National Oceanic and Atmospheric Administration (NOAA) and the Air Force to deliver instruments and other critical components to NASA in a timely manner. As a result, the project has experienced a 5-year launch delay and cost increases of 54 percent. Moreover, failure to launch the satellite as scheduled in October 2011 will cost NASA an additional $35 million." Bolden also refered to NPOESS as "one of my nightmares" and that it is "also one of John Holdren's nightmares" and "we won't talk about that unless you really want to.". NASA Without Clear Goals = ? By Keith Cowing on June 2, 2011 9:42 AM. "NASA's 2012 budget calls for money to invest in flight systems that would take humans beyond low-Earth orbit, including a deep space capsule and heavy lift rocket, and research to enable the long journeys. But near-term goals are scant in the budget request. Obama is recommending a slight increase for exploration, but much of it is slated to go toward partnerships with the commercial space industry to get cargo and crew to the international space station--part of the president's controversial push to privatize more of NASA's work." By Keith Cowing on June 2, 2011 9:35 AM. "And now there is only one. With Wednesday's landing of Endeavour, just one more space shuttle flight remains, putting an end to 30 years of Florida shuttle launches and more than 535 million miles of orbits controlled at Houston's Johnson Space Center. Now a sense of melancholy has permeated the community that calls itself "the space shuttle family." By Keith Cowing on June 1, 2011 2:41 PM. "This image was taken on May 21, 2011 and received on Earth May 22, 2011. The camera was pointing toward Titan at approximately 2,313,374 kilometers away, and the image was taken using the CL1 and GRN filters. This image has not been validated or calibrated." By Keith Cowing on June 1, 2011 2:30 PM. "The International Space Station's Tranquility node and Cupola are featured in one image photographed by a spacewalker during the STS-134 mission's third session of extravehicular activity (EVA). Inside,in another image, NASA astronaut Andrew Feustel, STS-134 mission specialist, uses a still camera to photograph the topography of a point on Earth from a window in the Cupola." By Keith Cowing on June 1, 2011 8:39 AM. Keith's note: The Morpheus Lander guys are looking to do live firing tests today. You can check their progress via @MorpheusLander on Twitter and watch live here. "A new lunar lander that NASA workers were testing apparently sparked a grass fire this afternoon on the grounds at the Johnson Space Center, officials said. The fire erupted about 2:40 p.m. in an empty field near Saturn and 2nd Street at the space center, officials said." By Keith Cowing on June 1, 2011 5:39 AM. "Space shuttle Endeavour and its six-astronaut crew sailed home for the final time, ending a 16-day journey of more than 6.5 million miles with a landing at 2:35 a.m. EDT on Wednesday at NASA's Kennedy Space Center in Florida. 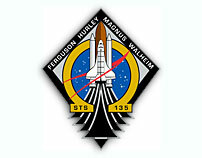 STS-134 was the last mission for the youngest of NASA's space shuttle fleet. Since 1992, Endeavour flew 25 missions, spent 299 days in space, orbited Earth 4,671 times and traveled 122,883,151 miles."